Correction. Rashod Bateman on the TD catch. Freshman receivers -- Bateman and Autman-Bell -- show their talent on that drive. Each comes down with jump balls for big catches. Gophers cut deficit 14-7. On third-and-goal, #Gophers QB Zack Annexstad hits Chris Autman-Bell for 3-yard TD pass, cutting Iowa's lead to 14-7. #Gophers on the move. Zack Annexstad hits Chris Autman-Bell for a 34-yard gain to the Iowa 7. After touchback on kickoff, #Gophers will start at their 25, down 14-0. Iowa QB escapes #Gophers pressure on third down, finds a wide-open Ihmir Smith-Marsette for a 60-yard TD pass and 14-0 lead with 5:48 left in first quarter. Two three-and-out series for Gophers, who have minus 5 yards of offense. #Gophers go three-and-out, and Iowa takes over at its 39 after punt. #Gophers start at 25 again after fair catch on kickoff. Nate Stanley was 5 of 6 passing for 48 yards and a TD on opening drive. Iowa takes 7-0 lead on #Gophers . Nate Stanley hits tight end T.J. Hockenson for a 3-yard TD pass. Iowa gets 9-yard completion on fourth-and-2 from the #Gophers 32. Iowa starts at its own 47 after 33-yard punt. After a Rashod Bateman dropped pass on second down, Anthony Nelson sacks #Gophers QB Zack Annexstad on third down, and Gophers have to punt. #Gophers start at their 25 after fair catch on kickoff. It’s a crisp 45 degrees and the sky is blanketed in a gray overcast. 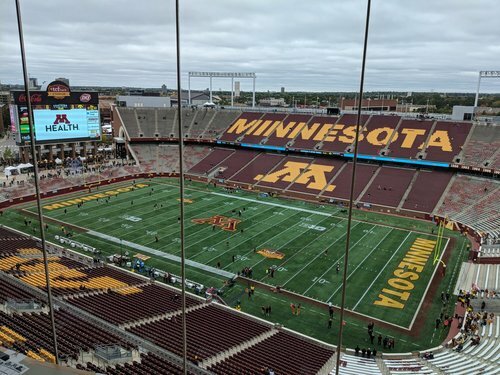 The #Gophers lost the coin toss and will receive to start their 100th homecoming game. 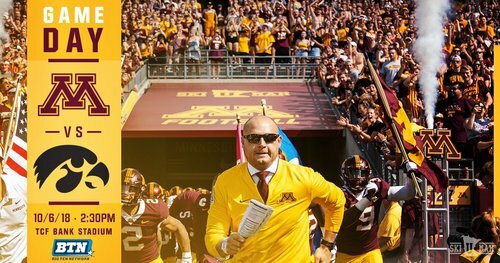 Minnesota is 2-0 when losing the coin toss this season and 6-4 under Fleck. Iowa wins coin toss and defers. #Gophers get ball first.